It wasn’t a glamorous way to die, but he’d never liked attention. Not like Scott McKenna, who drove his Pontiac off the 496 overpass when the Grand River plant closed. Scott had style and an axe to grind, and everybody knew it. The State Journal had a field day. For him, no bangs, no whimpers. Just drink expanding to fill the space available, doubles doubled double-time, until his liver pink-slipped the whole mortal coil. 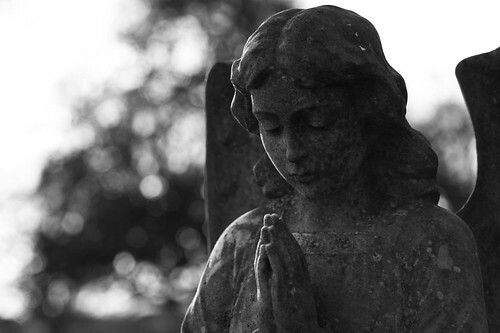 He glares at the granite angel praying on his headstone. Praying. He wonders what for. If he had his say, a recliner, an IPA, and the Tigers on real quiet in the background. More likely, world peace. Angel stuff. He kicks the headstone. It doesn’t connect. Obviously. When she comes, she’s wearing the peacoat he bought her, the one she never wore. She’d skipped the funeral, of course. He’d been so long about dying. Rude, really. He hopes some of him will catch her eye. An elbow, or a scruff of beard. She could tell him from a beard, sure. She’d always hated that beard. She stands a minute, not more. Then she smiles, off-center. “Rest in peace, you sonofabitch,” she says, and turns. The angel prays on, just to spite him. Allison Epstein is a twenty-something writer, editor, proofreader, marketer, feminist, and amateur Shakespearian living in Chicago. Her writing has appeared or is forthcoming in The Huffington Post, Adios Barbie, and Ugly Sapling. Find her on her blog, on Twitter @AllisonEpstein2, or wherever heated debates about em dashes are underway.